We use this dry spice rub on everything, because it’s packed with flavor and adds a perfectly balanced punch of spice to every bite. Grilling meat and veggies for a barbecue inevitably leads to a satisfying experience. When the meat becomes tender on the grill and gets those crunchy brunt ends from the flames, it’s so tasty. But I don’t think any meat you grill or even make in the oven that’s meant for an outdoor party of barbecue must have a dry rub to become amazing. 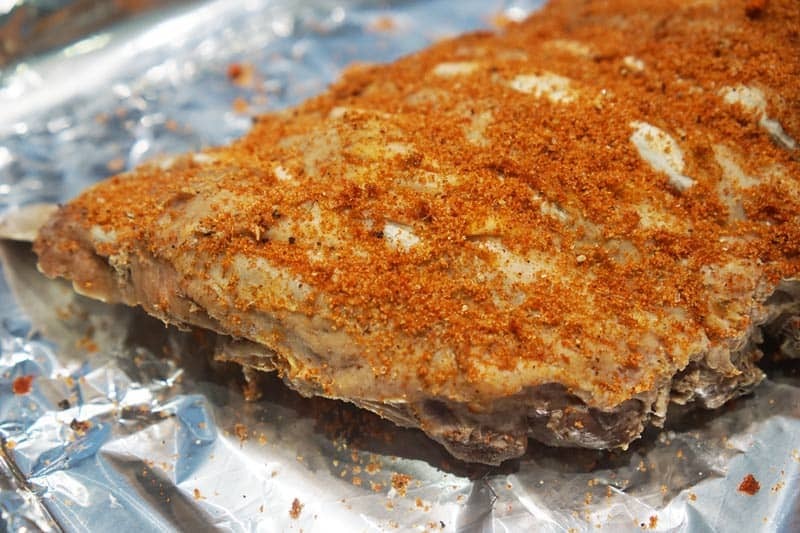 The key to giving these ribs intense flavor is in the rub. A perfectly balanced dry rub does wonders for the flavor, but also seals in the juices and keeps the ribs from drying out. I swear by this bbq rib rub. It’s actually great on all types of meat, not just ribs. But I think it adds just the right amount of spice to the ribs. This rub is extremely versatile. You can put it on just about anything – from baby back ribs to chicken, steak, prime rib, or veggies. I mix up a double batch and put it in a spice container to use throughout the month as I cook various dishes. It adds an extra kick to veggies that would otherwise likely be served with just salt and pepper. Just a little sprinkle of this rub on your veggies will really bring out the flavor and make them irresistible. If you’re wondering why you might want to use a dry rub instead of marinade, there are actually quite a few reasons. If you’ve ever seared a piece of meat before, you know that the liquid from the meat has to dry up or evaporate before you can get a good sear. That means, the wetter the meat, the longer it will take to evaporate. With a dry rub, you’re avoiding adding extra moisture to the surface of the meat, so a nice caramelized sear will form on the meat quicker. A dry rub also has more concentrated flavor. If you have a robust spice rack, like I do, you’ll probably always have the right spices to mix this up. If you don’t keep a lot of spices at home, the best way to stock up for this rub is to get your spices from a bulk spice counter, like the ones they have at Whole Foods. You won’t have to buy large quantities of each spice in order to make this rub. Most people don’t have dried mustard if their spice rack. You can leave it out if you don’t have it. It won’t affect the flavor of the rub too much. I do recommend getting it though. It has a lot of uses. I use it in my stovetop mac and cheese recipe too. Add all of the spices to a bowl and mix them thoroughly. I sometimes put them all in a ziplock bag instead, so it’s easier to mix it all together. Then you can sprinkle the rub onto your meat or veggies without contaminating it with your fingers. And you can keep the leftover rub in the plastic bag until you use it again. If you’re looking for a recipe to try this with, my favorite use for this dry rub is pork baby back ribs. Try our recipe for baby back ribs using this dry rub. It adds so much extra flavor that you’ll be convinced never to make ribs without it again. 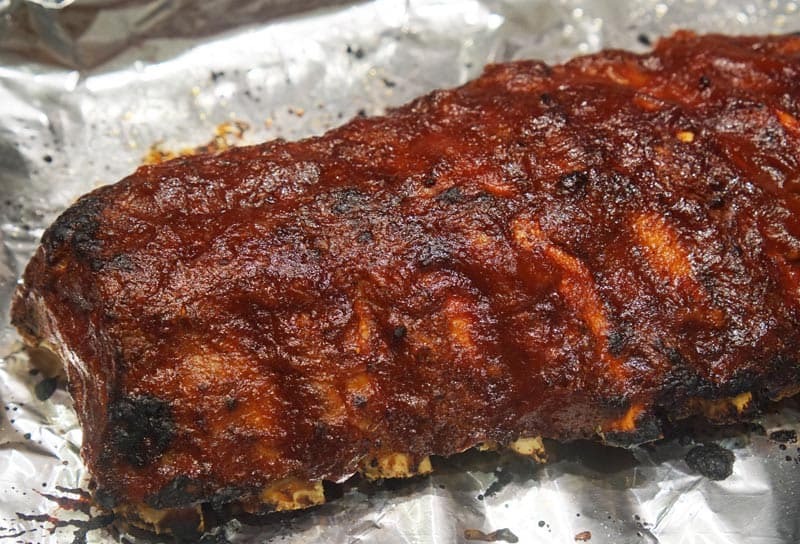 You’ll always want to try our homemade Bourbon BBQ sauce with these ribs. I mean, doesn’t that rack of ribs below look tasty? The best part about this recipe is that it’s incredibly scale-able. You can make as much rub as you need just by adjusting the quantities. If you’re making many racks of ribs for a party, just double or triple the dry rub recipe..
Like this recipes? Be sure to save it on your Pinterest board for later. 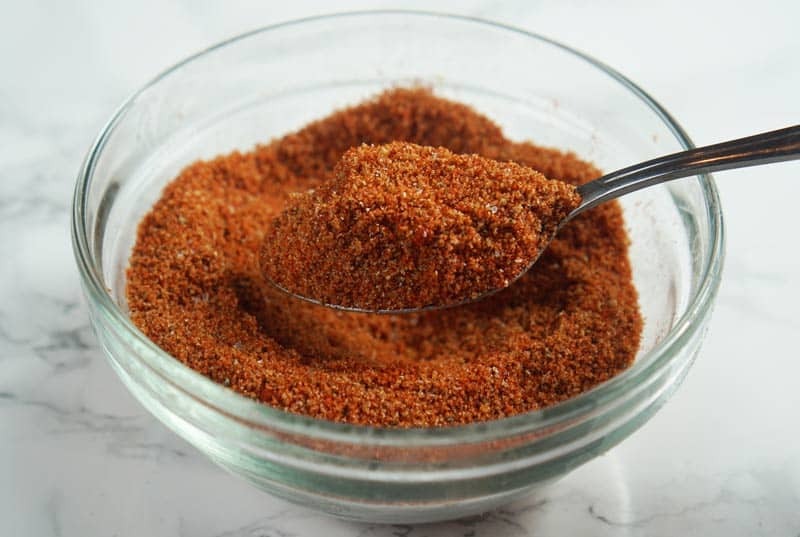 We use this dry spice rub on everything, because it's packed with flavor and adds a perfectly balanced punch of spice to ever bite. Mix all spices together until well combined. Rub literally on ribs, chicken, and veggies.